Editor's Note: CNN Belief Blog Co-Editor Eric Marrapodi files this report from Washington, DC. Brothers Christopher and Peter Hitchens squared off Tuesday in a debate over whether civilization can survive without God. Christopher, the older of the two, is a renowned atheist thinker and author. Peter, the lesser known of the two, is a practicing Christian and also a well-regarded author. 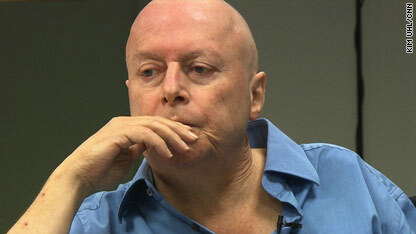 Christopher Hitchens is going through a very public battle with cancer, a subject that came up often during the debate. Michael Cromartie from the Ethics and Public Policy Center, moderated the debate and mentioned Christopher, who lives in the District of Columbia, was attending in between doctor appointments. 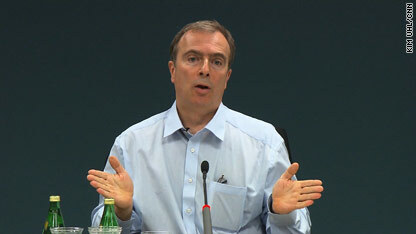 Peter Hitchens had flown in from England specifically for the lunchtime debate. Christopher Hitchens arrived with a white straw Panama hat. Beneath the hat he has no hair, lost from cancer treatments. Though noticeably thinner, Hitchens did not seem to suffer any intellectual consequences from his treatment. He argued civilization could survive without God and in many cases is surviving without God. To further his point he added examples from his own life of interacting with people of faith. He specifically pointed to two American examples: Reform Judaism and self-described American “cafeteria Catholics” who pick and choose aspects of their faith they find appealing. That, he argued, proved God, and to a larger extent organized religion, are unnecessary to continuing civilization. His brother Peter took the opposite side. He was quick to clarify later in the event he was arguing from the perspective of Christianity and not from the perspective of all religions. In Peter Hitchens’ remarks he described his time as a journalist covering the fall of Mogadishu and the crumbling of his boyhood neighborhood in England to roving thugs. He said both examples showed a massive decline of civilization, and he said the civilization we see today could disappear. “The behavior of human beings towards one another has sunk to levels not far from the Stone Age,” he said. While the two were on opposite ends of the spectrum when it came to the role and place of God in civilization, they did find unique common ground on Christopher Hitchens' cancer. During the question-and-answer session, NPR Religion Correspondent Barbara Bradley Hagerty asked Christopher about the prayers of support he had received from Christians. The event was put on by the Pew Forum on Religion and Public Life. It was billed as a conversation between the brothers and the press. As a result, no winner of the debate was announced. I'm extremely impressed with your writing skills and also with the layout on your blog. Is this a paid theme or did you customize it yourself? Anyway keep up the excellent quality writing, it is rare to see a nice blog like this one these days. What's up, this weekend is good in favor of me, since this point in time i am reading this enormous informative paragraph here at my residence. whoah this blog is great i really like studying your articles. Stay up the great work! You recognize, many individuals are searching round for this info, you could help them greatly. What is up with all the female user names? It's weird...usually those types of posts contain links in the name they're trying to lure you to...not sure... Maybe whatever code they're using to automate that junk is faulty? Everyone loves what you guys tend to be up too. This type of clever work and coverage! Keep up the excellent works guys I've added you guys to our blogroll. It is actually a nice and helpful piece of info. I am satisfied that you just shared this useful information with us. Please stay us up to date like this. Thanks for sharing. Appreciation to my father who shared with me concerning this webpage, this webpage is in fact remarkable. I was very pleased to discover this web site. I want to to thank you for ones time just for this wonderful read!! I definitely really liked every little bit of it and i also have you bookmarked to look at new information on your web site. Your method of explaining everything in this article is genuinely pleasant, every one be able to simply know it, Thanks a lot. I am extremely impressed with your writing skills and also with the layout on your weblog. Is this a paid theme or did you customize it yourself? Anyway keep up the nice quality writing, it's rare to see a nice blog like this one today. Let's hope it's more coherent than this. Woah this blog is magnificent i love reading your articles. Stay up the good work! You realize, a lot of individuals are looking around for this information, you could aid them greatly. Thanks , I've just been looking for info about this topic for a while and yours is the best I have found out till now. However, what in regards to the bottom line? Are you sure in regards to the supply?|What i don't realize is in truth how you're now not really much more neatly-liked than you may be right now. You're so intelligent. I was very happy to search out this net-site.I wished to thanks for your time for this excellent read!! I positively having fun with every little bit of it and I've you bookmarked to check out new stuff you blog post.